Here's a picture of Merton's best cycle route. Unfortunately, as you can see, it is not in an ideal state to encourage mass cycling. The surface looks like a mixture of aggregate, sand and clay, and hasn't been well-constructed. There is no proper camber, and shallow depressions have formed all the way along and across the surface, which isn't very porous. The end result is more like a canal than a cycleway. When it rains, the surface is about 90% puddle, 10% slippery mud, and it stays that way for days afterwards. If you ride along the path when it's in this state (which it was about three-quarters of last year) your clothes will be mud-spattered and your drivetrain will last about as long as an X-factor-winner's career. Even the best of mudguards are no match for these conditions, however slowly and carefully you ride. This is a little shortcut that cuts off two sides of the triangle as you approach the tram tracks just before Morden Hall Park. It started off as a narrow foot track. Then people on bikes started using it because it was often more usable than the official trail. But as the track got more used, it became muddier and more eroded, so people started walking and riding on the grass by the side. As you can see, this process has destroyed the vegetation and we've ended up with something reminiscent of Glastonbury in a bad year. This is what happens when you create sub-standard infrastructure. If instead of using 'natural' (read unsuitable) materials for the track they'd used tarmac, a lot more people would use it and there would be no damage to the vegetation surrounding the trail. There counter-argument is that tarmac isn't natural and therefore unsuitable for parkland. I don't buy that. No artificially-constructed trail is, or looks natural, even if it's made of mud. You can make tarmac unobtrusive; it is possible to create a path that is fit for purpose without ruining the natural ambience. What is really ruinous of the city environment is the idea that cyclists need to be relegated to this kind of crap, while motor traffic is free to intimidate them off even the most residential of roads. It would relieve a lot of stress on parks if people could enjoy a pleasant walk or cycle in their local neighborhood, instead of every square centimeter of streetscape being used for wider, faster roads or car parking. I like the Wandle Trail, I really do. But it's constructed as a leisure route, not suitable for general transport use. The fact that it's a rough track wouldn't matter if it were not for the lack of alternatives suitable for those without sideburns. As it is, the alternatives are so unpalatable, the trail is pressed into service for all kinds of journeys by those not suffering from hydrophobia, while people who need to arrive at their destination without requiring a change of clothes and a new chain, are put off cycling altogether. In a nature reserve along the coast in Holland, the tarmac was ripped up for being not natural as well. Especially because it was an area used for filtering drinking water. Wisely they decided to replace it with 5 m wide roads of concrete 'bricks' as paving. Wonderful cycling surroundings. 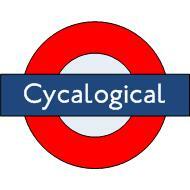 I often cycle the Wandle Trail and have - like you - cursed that particular section many times. A cycle ride across south London should not result in your shoes and trousers getting plastered in mud! 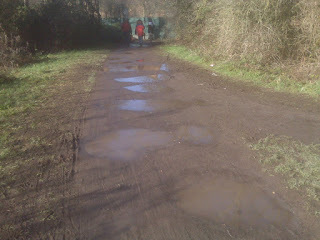 Sadly much of our “National Cycle Network” is in a similar poor state. Do you know of any plans to improve this stretch of the route? A cycle path should be rideable on any kind of bike. There's no way I'd take my roadie along here, or even my commuter with slick tyres - it looks like it needs a mountain bike! This is entirely typical of the NCN. Around these parts (Manchester) you can also add gates that prevent long bikes with trailers, wide panniers, tandems, trikes or similar from using at all. It seems somehow wrong that I have embarked on the construction of a bike specifically to deal exploring NCN with these sorts of conditions. I'm an enthusiast so don't mind too much but there is no way this sort of infrastructure will encourage mass use of the bike for everyday transport. There is a place for a little 'rough stuff' but do not pass it off as cycling infrastructure. 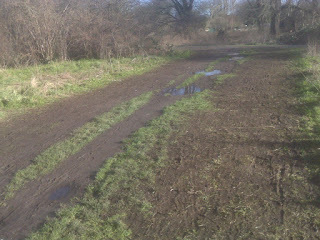 ... Merton's best cycle route is *unpaved*? Wow. Merton has quite a way to go, it seems. Doing the Lambeth Walk - In Berkshire?